I want to believe that it was last year, but I know that it was actually much earlier than that when Dove came out with their Hair Fall Rescue line in the Middle East. 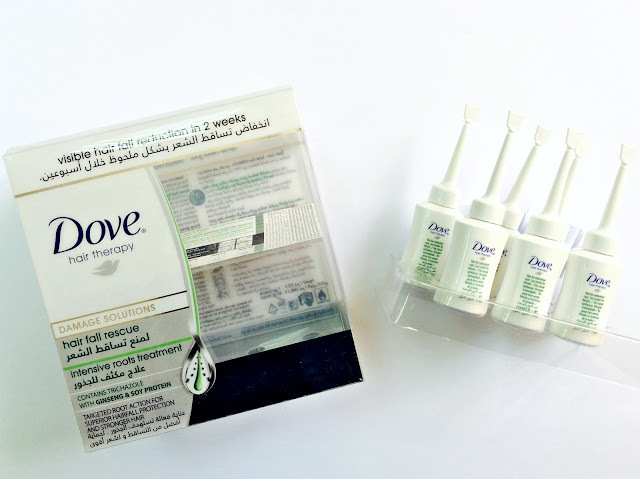 During its release, Dove had given out a 1000 hampers to their facebook fans to try out. The line included a shampoo and conditioner, pretty standard and I used both up right away. Can't say that both really stopped any hair fall, but they performed well at cleansing and conditioning my hair and I was happy to use them. I was also given a leave in conditioner. Its a creamy formula that nourishes, boosts moisture, reduces frizz and makes my unruly hair more manageable. No complaints there either and I still love using it. I only use it on the lengths of my hair though and avoid the roots as it can weigh hair down. Also in the hamper was a small plastic box containing vials or powershots of the Intensive Roots Treatment which promised visible hair fall reduction in just two weeks and contained trichazole along with ginseng and soy protein. I had used just one of the vials and put it aside without giving it a further thought and I often wondered why. Now, I love hair treatments and serums and since using up the Wella SP Balance Scalp Energy Serum (review here), I was on the lookout to try something new and on spotting this sitting on my bathroom shelf, decided to give it another whirl. Now packaging wise, you get 7 vials, each containing 7 ml of the roots treatment. I love it when serums are individually packaged as it takes away the guess work of how much to use for each sitting. Directions say to use the vials on freshly washed towel dried hair every two days, so essentially you have enough for a fortnight. To use it, break off the tip of the nozzle, squeeze and run the tip along your scalp, parting your hair into different sections and massaging the serum in as you go. Now here's my first problem, breaking off the tip leaves you with an uneven edge and if I'm going to run something against my scalp, I want it to feel soft or at least a little more rounded. Second, the vial is quite poorly designed and the nozzle should have been more funnel shaped extending right to the outer edges of the bottle. Instead, what we have is a very tiny cylindrical nozzle that sits right in the middle. Not a biggy you might say, but this serum is quite thick and a good portion of it gets trapped on either side of the nozzle. Because of this, you need to give the tiny bottle a shake every few or so seconds in order to position the serum right at the mouth of the bottle. 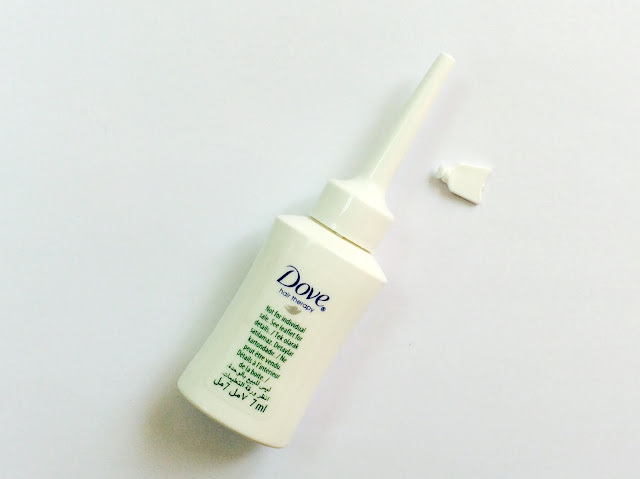 Now that is inconvenient and stops you from applying the serum in one go. Third, serums are meant to be leave-in treatments and when I use one, I want it to be invisible and undetectable. This treatment is however so thick that my hair is left feeling tacky and looks like I've applied a rather obnoxious amount of styling gel through my hair (think Ross Gellar!). Though the stickiness does tone down after a few hours, I still look like I've gone too long between washes and my roots look greasy. Not at all ideal and I end up washing my hair the very next day instead of leaving the serum in for two days as advised on the package. Now, does the serum work? I have absolutely no idea. The ingredients list sounds impressive and I'm sure it will reduce hair fall if used consistently, but the thought of walking around with sticky and greasy looking roots is just unthinkable. The product does smell lovely though. Its funny how all the reviews I've read, sponsored posts I should add, on this root treatment praise it like no other, each claiming that it has reduced the poster's hair fall and just how much they're in love with it without mentioning the stickiness and wet look that comes along with it. Genuine much? So, in conclusion, maybe an awesome product, I will just never know. I can get over the shortcomings in the package design, but I can't get over the sticky formula. 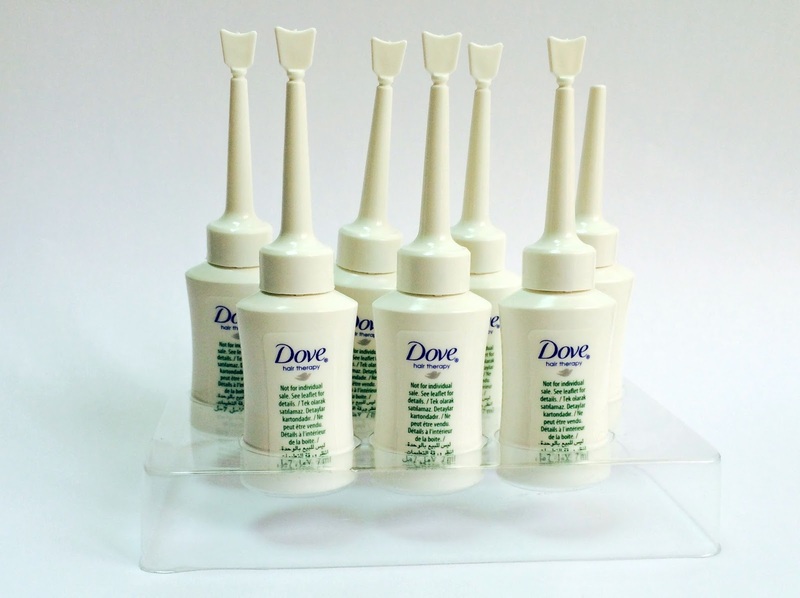 Which is sad as Dove is an affordable hair care brand that has some really great products! Perhaps if it were to be reformulated to be more water-like, I would definitely give it another go, but for now, sorry, this belongs in the bin.